I’ve been out of the blogging game for a few weeks now. There are a few reasons for this; I’ve been trying to take a break from beer after my recent North America trip; I’ve also been busy with extra training to help burn off the cushion that’s appeared around my midsection after said North America trip; and I’ve been re-adjusting to ‘real’ life again, aka. crying myself to sleep because I’m no longer on holidays. So it’s about time I get my shot together and brush the cobwebs off ChasingAle.com. What better way to start than by raising some dollars for a good cause. 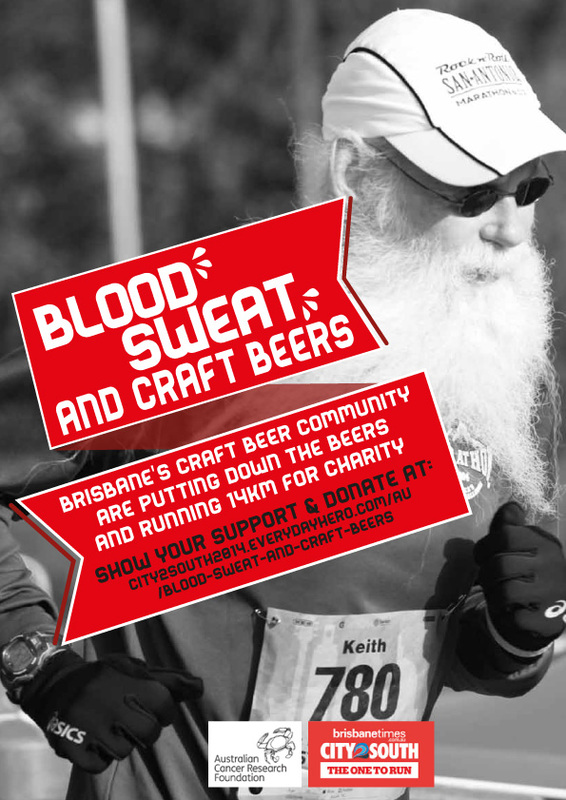 Blood Sweat and Craft Beers are a team of Brisbane based beery folk who are running in the City2South event this Sunday 15 June. Headed up by Jim Gold of Tippler’s Tap, they’ll be tackling a 14 kilometer run in order to prove that a diet involving quality craft beer assists the human body to endure extended periods of physical exertion. More importantly though (and a bit more accurately) they’ll also be raising money for the Australian Cancer Research Foundation. I was overseas when I caught wind of this, and I wanted to help! I love a good physical challenge, so running 14km for a good cause was right up my alley. So a few days after I returned from my US trip I went for an early morning run with Jason from Brews and Bacon, one of the runners in the team. After slowing him down to almost a walk for 4.3 kilometers I was spent! I let him finish on his own while I lay down and considered the meaning of life, coming to the realization that America had affected my fitness much more than I wished to admit. So this time I’m taking the easier way out and donating money to this great cause instead. If you want to donate as well, there’s a link at the bottom of this post…or, maybe you could drink some beer instead? In proper beer geek fashion, the team have brewed a beer for the occasion called City2Stout – a smoky breakfast stout designed to provide sustenance for energetic runners. There will be a karma keg of this brew at Tippler’s Tap tonight – pay whatever you want, knowing that all cash will go straight to the ACRF. It’s a mighty tasty way to do a good thing. I had to leave at 10pm tonight. Sorry if I missed you.